Got Pain? Get Curamin® Extra Strength and Save 20% Off MSRP! 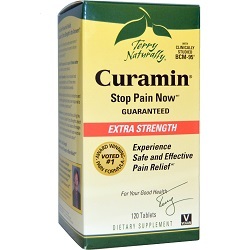 When you need relief, Curamin® Extra Strength by Terry Naturally®, is the safe, effective, and natural choice. Curamin provides an amazing curcumin extract from turmeric called BCM-95®, blended with superior ingredients for award-winning pain relief. BCM-95® has been proven in published clinical studies to provide consistent and long-lasting effects. What's the secret? Combining the best of the best. Curamin contains a super-absorption curcumin called BCM-95® that is significantly better absorbed than plain curcumin products. BCM-95® has been proven in published clinical studies to provide consistent and long-lasting effects. The impact of BosPure® Boswellia is enhanced by reducing beta-boswellic acid and providing naturally higher levels of AKBA. DLPA may support healthy activity of endorphins and enkephalins, and nattokinase helps healthy circulation, an important feature for proper nutrient delivery and effectiveness. Ingredients: (per serving) Proprietary Complex - 2,706 mg of DLPA (DL-phenylalanine), Boswellia (Boswellia serrata) Gum Resin Extract (BosPure®) standardized to contain >70% Total Organic and Boswellic Acids with AKBA >10%, with less than 5% beta-boswellic acids, Curcumin (Curcuma longa) Rhizome Extract (BCM-95®) enhanced with turmeric essential oils and standardized for curcuminoid complex (curcumin, demethoxycurcumin and bisdemethoxycurcumin), Nattokinase. Lab tested for purity and safety. BosPure® and BCM-95® are registered trademarks of Dolcas-Biotech. All EuroPharma products are actually free of soy. We list “contains soy” if a formula contains phospholipids, nattokinase and vitamin K2 which are extracted from soy. The chance of these healthy ingredients causing a risk of allergies is extremely low or non-existent. They contain a possible soy content in parts per million.